In this, the last post of the Transformer series, I’ll cover security issues, look at accessories to get for it, summarize my assessment of this tablet against the iPad2, and suggest which model to buy. Security. This topic creates a number of conflicts for those who want to increasingly replace their PCs with a tablet. Highly portable devices are exceptionally exposed to being lost or stolen, and are thus vulnerable to direct hacking, as well as remote web-based hacking attempts. My approach to all portable devices is to assume they will be stolen, and then sort out security to suit, rather than load them up with data and hope for the best. Fortunately Android on the Transformer comes with some reasonable security features. Firstly the system can be locked prior to the home screen with a PIN or alpha password (as can the iPad2). A message with your email and phone number can be placed on this screen should a lost system be found by an honest citizen. In addition, in a new Android 3.1 feature, the entire primary system (but not the microSD card) can be encrypted with a system command, and only unlocked with a password (this takes over an hour for the first encryption, and uses more battery life thereafter). Antivirus apps from the likes of MacAfee can also be installed, and 3rd party apps can also encrypt the microSD card. I would say though that the best route to security is not to have information on the tablet that will put you at risk if you lose it. Keeping everything in the cloud is one pretty good way of doing that – using Google Docs for example. In particular, I suggest you don’t store key data such as passwords locally. I personally use an extremely strong master password with the web-based LastPass for accessing a small number of web sites. This also protects against keystroke phishing attacks. I also have all my email and contacts on Gmail, and if the device is lost, or suspected of being compromised, then I change the master Google password. Accessories. The first thing you’ll want to get your Transformer is a case, as it doesn’t come out of the box with one, and the screen, while robust, clearly needs protection. I started with a 3rd party case that folds cleverly to form a stand with multiple different heights and angles. This turned out to be a bit of a dead loss, however, as the case weighed 350g, half of the Transformer’s weight, and taking the combination with the keyboard dock to nearly 1.7 kg. I Instead of this, I now use a simple zipped and padded slipcover from Amazon, weighing around 100g, which also has two compartments allowing the keyboard to be stowed in the side pocket. Very neat and practical, and only £10 or so including shipping. As the case does not provide a stand function anymore, I bought a separate stand. Again I have made a few tries. My first attempt was an elegant aluminium folding stand from Amazon, which looks and feels very classy, and cost only £12.99 including delivery. Something very like this is available from the Apple store, for £39.99, so this was something of a bargain. Sadly, despite it’s elegance, it also weighed too much – around 300g also. I finally settled on something less pretty, but way lighter, at under 100g, and very practical. This Arkon plastic folding stand from Amazon cost around £15 including shipping and is recommended – with lots of different positions for the tablet, low weight and folded size, and excellent stability. 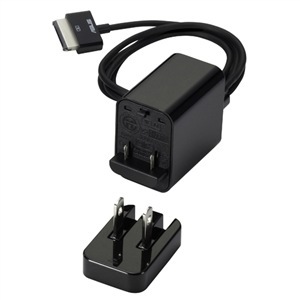 An additional USB charger and cable is a good idea – these have now finally become available from Asus via their web store at a rather steep £29.99 including postage. The Transformer charger turns out to run at something like 11 volts, and uses USB3 pins, so your normal run-of-the mill 5 volt USB charger, will not charge it, and neither will your PC’s USB socket. This accessory is not essential, but useful if your main charger or cable gets damaged, or if you want two charging points. The only other item I have bought specifically for this tablet is a 2m USB3 extension cable, also from Amazon, to enable me to charge the thing and use it at the same time. As I mentioned in the second post of this series, I have a built-in aversion to Apple products. This is a personal thing – and I am not suggesting for a second that anyone else should have the same prejudices. But that aversion informed my review of the Asus Transformer, and prompted the (e.y.h.o.a) comparisons along the way. At the start of the review I was aware of a few areas where the Transformer had an edge. To my surprise, as I went through the detail, I found dozens of examples of functions that I wanted or used that were superior on Android or the Transformer to the iPad. That I have to say was a surprise to me. In fact in some areas Apple is scrambling to catch up with Android. Early disclosures have indicated that IOS 5 will have multi-tasking, notifications, over-the-air (OTA) system updates, and possibly even widgets – all features Android users have enjoyed from day one. And that illustrates the point that this technology is a moving target. All I can say is that from a direct comparison of both devices, and for the application usage I have outlined in the past few posts, the Asus Transformer is a far superior offering to the iPad2. Providing of course, you are reasonably skilled, and are prepared to set up the device properly. Currently you can get the Transformer in 16GB or 32 GB wi-fi only variants, with or without a keyboard in the package. A 3G version is not yet available, although it is rumoured to be coming. Now some may say I have left out a key iPad2 advantage of actually providing 3G support at the top end of the range. However, if you own a modern Android phone, ideally unlocked, you can use it in tethered mode, i.e. acting as a 3G router for attached wi-fi devices. This is not possible on iPhones without jailbreaking them (e.y.h.o.a). Since I never go out without the ‘droid phone, I am able to use this facility to connect the Transformer. This has the additional benefit that I use a single low-cost data data plan, as opposed to one for the phone and one for the tablet. For me then, the ideal model of the Transformer is the cheapest, 16GB version. A 32 GB microSD card an be added for very little money, and I don’t use the keyboard enough to make it worth the extra cost. It’s currently available at Amazon for £349, or £50 less than the iPad2 for what I consider to be a better product. Note: I have used links to Amazon for many of these these items mostly because eBay links are short-lived, and there are usually equivalent Amazon products in the US and UK stores. I have no connection, paid or otherwise to Amazon, other than having helped them get rich by being a customer (since 1999! ).